My parents love cooking up a feast and hosting parties at home. If you know my dad, you may remember his famous roast beef- 6 pounds of rib eye slathered with salt/pepper/mustard and low roasted for 3+ hours, de-lish-us! 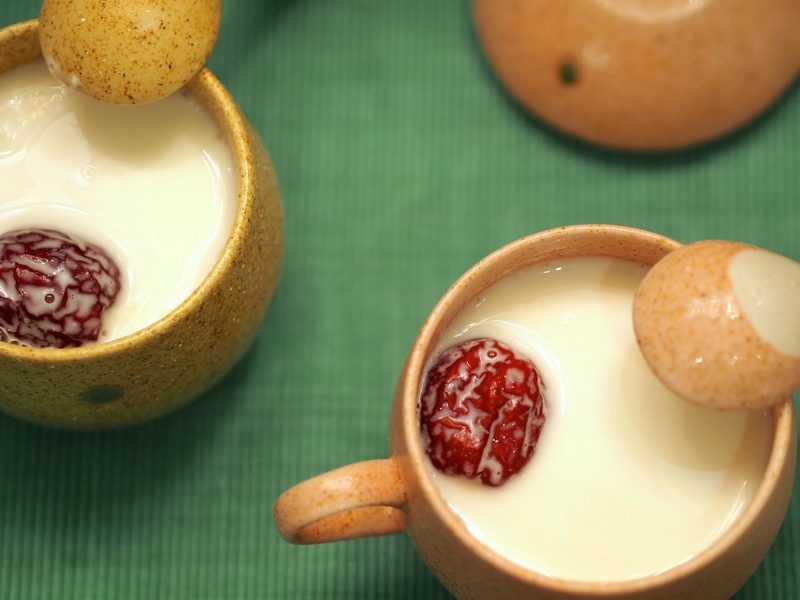 His newest creation is this almond tea- nourishing, healthy, and oh so silky smooth! When I posted a photo of him making this for me on Instagram my friend Jenni immediately asked for the recipe, so I teamed up with my dad to bring this to you! 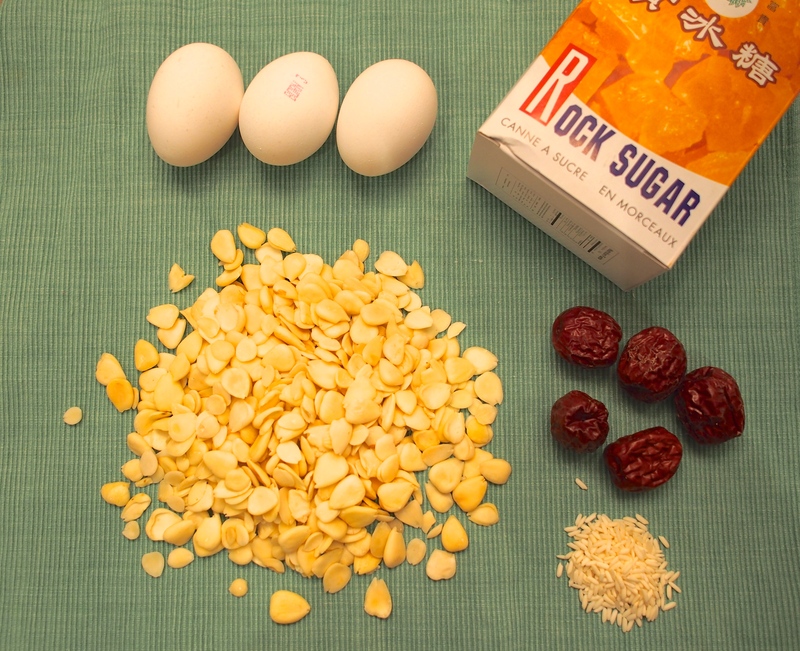 You can add egg whites and red dates as demonstrated here, or bird’s nest works really well too! PS. I love you Daddy!! Thank you for being so supportive, always reading and sharing my blog with friends! 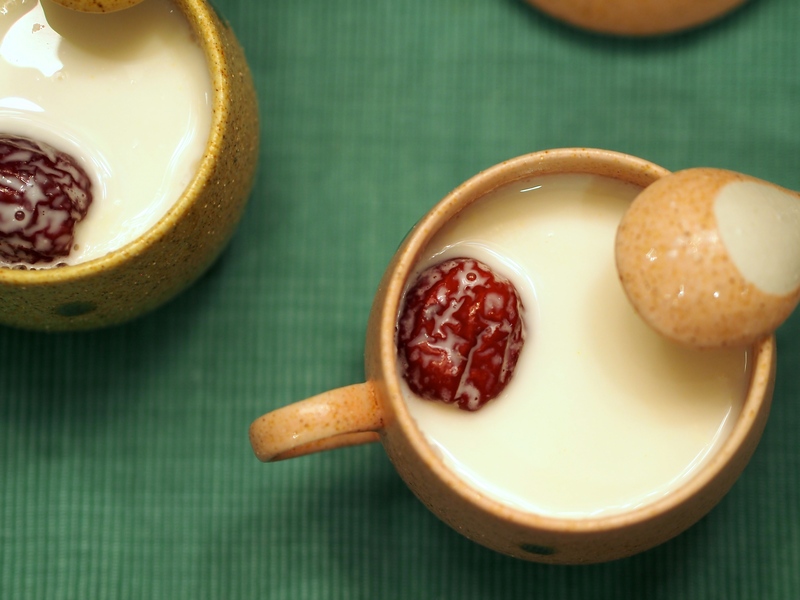 We’ve used two types of Chinese almonds called sweet almonds南杏 and bitter almonds北杏. Sweet almonds are larger and functionally quite similar to the western almonds we commonly find in super stores. On the other hand, because of their bitter taste and mild toxicity, bitter almonds cannot be eaten raw and are usually only used in Chinese medicine to clear and nourish the lungs and intestines. Now don’t worry, once you soak and boil the bitter almonds, it is safe to consume. Because of these properties, the best balanced ratio (in weight) is 4 sweet almonds 南杏 to 1 bitter almond北杏. 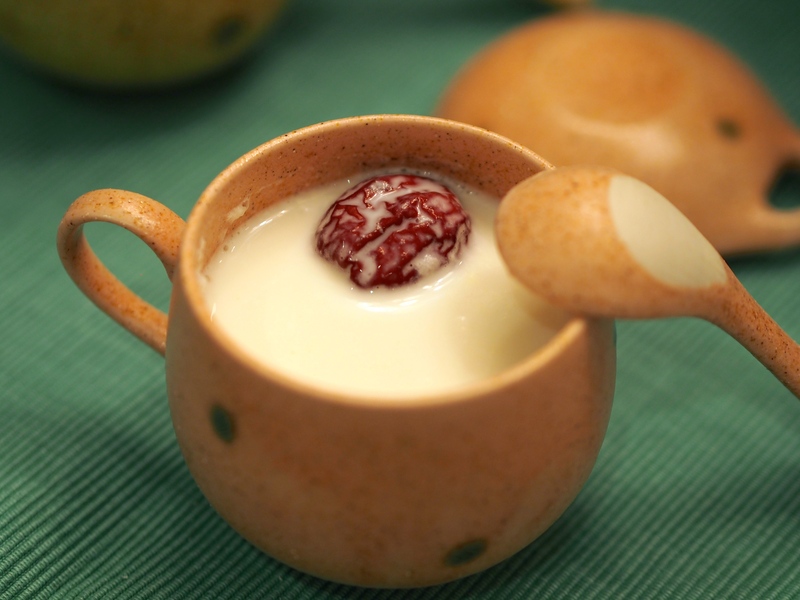 Lastly, we added some glutinous rice to make the almond tea thicker and creamier. You can also use regular western almonds instead- left unpeeled will have extra fibers but will colour the tea. Benefits of almonds: Almonds are high in vitamin E, healthy monounsaturated fats, magnesium, potassium, and protein, giving this antioxidant super food the ability to lower cholesterol, risk of cancer, diabetes, and heart disease. My favourite part? It can also brighten and moisturize your skin and hair too! Where to buy: You can buy these peeled 南北杏 at your local Chinese dried seafood or herbal medicine shop. 1. Soak the almonds and glutinous rice for 30 minutes in warm water, then drain. 2. 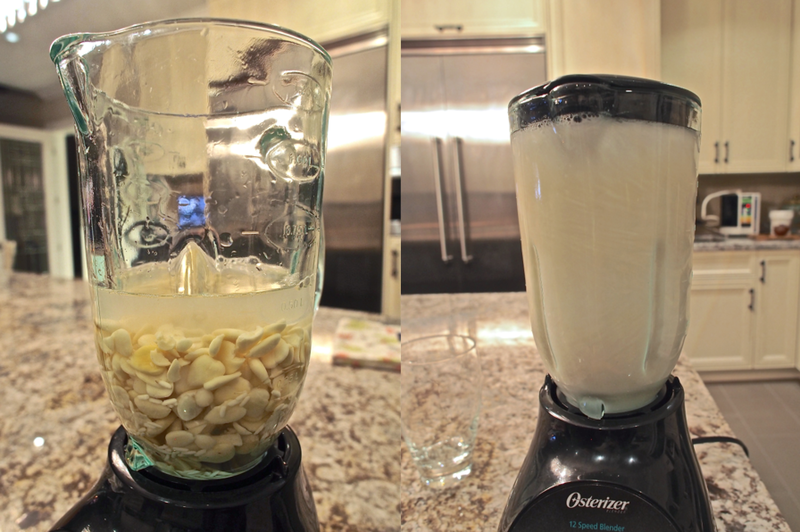 Add the almonds, glutinous rice, and enough warm water to cover the almonds into the blender and blend until smooth. Then gradually add the rest of the water, blending for another 2 minutes until the grains feel finer than sand. *if you add all the water at once, it won’t be able to slice the almonds as finely. 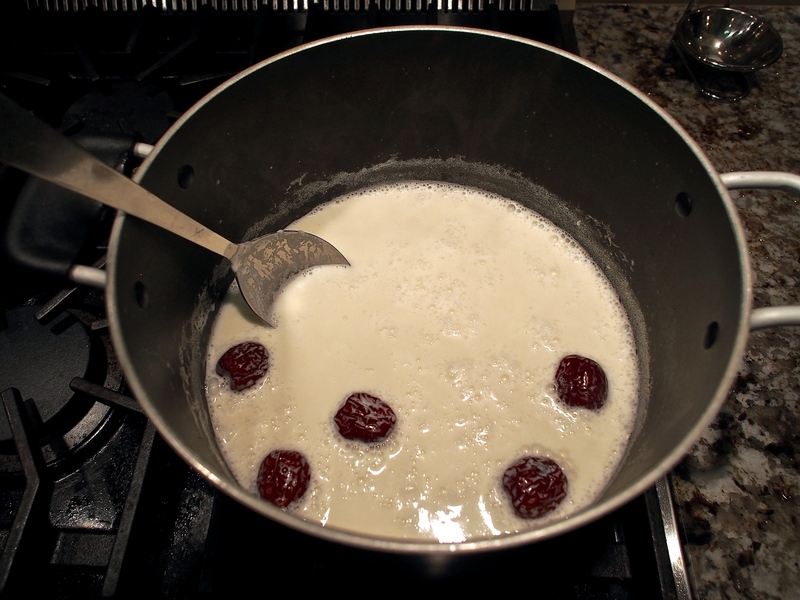 *For a consistency like heavy cream, add 4 cups- add more or less to your liking. *After this point, my dad also runs it through a cold press juicer to further grind the almonds, but this is not necessary if you don’t have one of these machines. 3. Filter through the coffee strainer, use a spoon to scrape off the pulp from the sides and keep mixing with the liquid. *Try to find a large cloth coffee/tea filter bag with very tight mesh rather than small coffee filters so you don’t need to pour little by little. *If the consistency of the almond tea is too thick, you can slowly add water directly into the pulp in the strainer and mix while it filters out. 4. 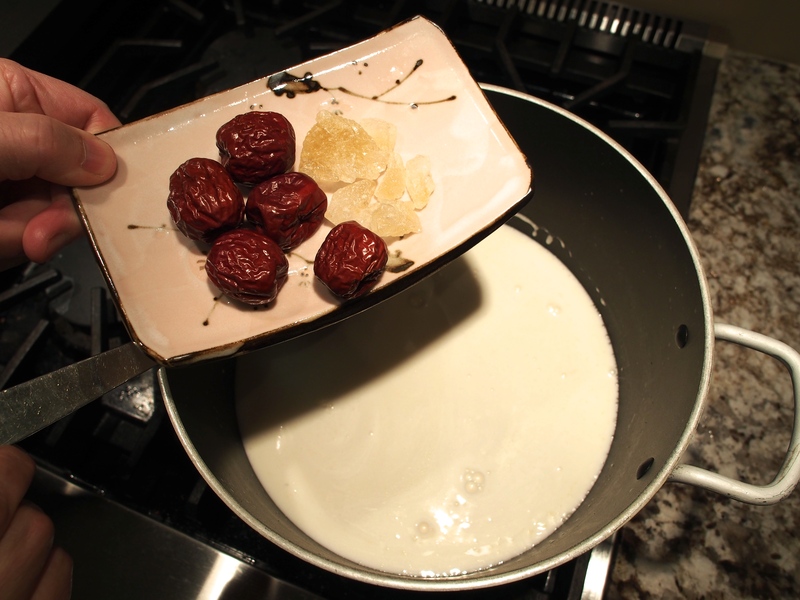 Bring to a boil on medium heat; snip the dates several times with scissors, then add with crystal sugar and simmer on low heat for 5 minutes. *Make sure to stir constantly and don’t put the lid on. 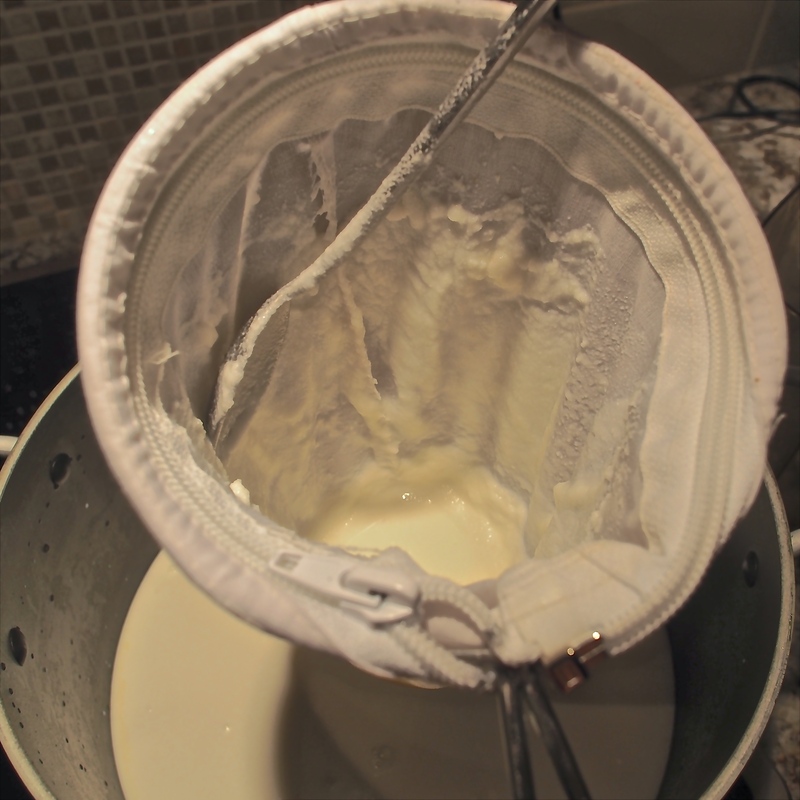 It can catch and burn really easily and will expand when boiling (like milk)! 5. Lightly beat the egg whites, pour into the almond tea, lightly stir just to loosen, turn off the heat immediately. 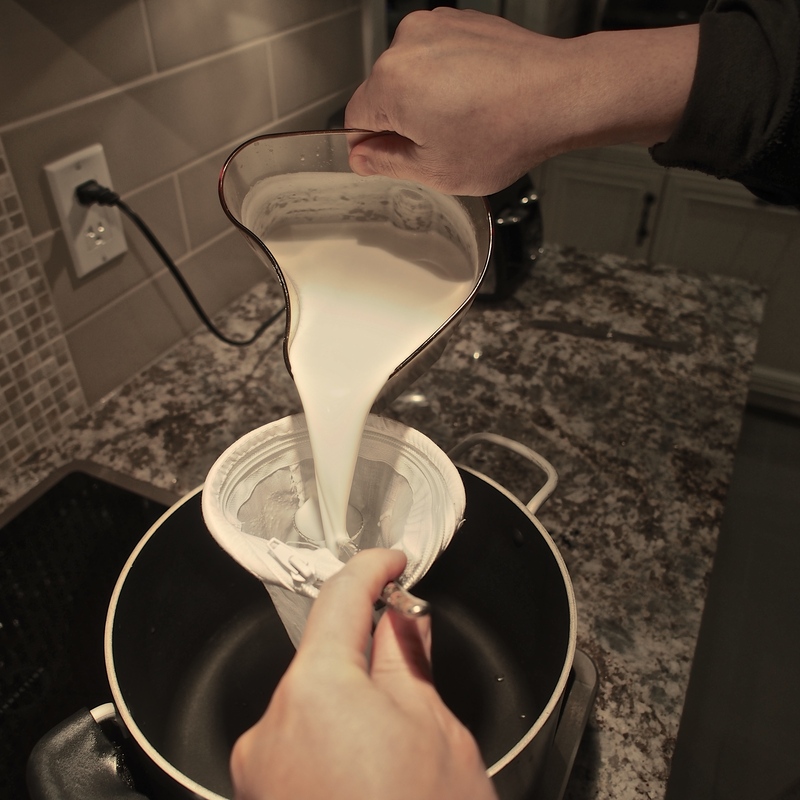 * We don’t want the egg whites to be overcooked so do this part just before serving. *If you are adding bird’s nest, add it in this last step as well. That’s it! Super easy and nourishing. I hope you enjoy and please send me a photo if you try this or use #cookedforyoublog to share on instagram! And BTW, this is what the remaining pulp will look like. So as not to waste, we can make a DIY face/body scrub mask or soak- add some honey/yoghurt/olive oil for a natural whitening and moisturising effect! Do you have a printer friendly edition? I’ll bet it is amazing! how about using glutinous rice powder? can i use it? if i can, how many do i need for this recipee? thankyouuuuu sweetie..
Hi. Thanks for sharing. Such a warming dessert in Winter time (Australia). The smell of almond after grinding is so refreshing. I have tried one day using the chinese almond and the next day using the western almond. I found the Western Almond does not has as much fragrant compared to the Chinese almond. Do you have similar experience? Thanks for the recipe, good balance of flavour and consistency. I even Used this recipe for making almond jelly and just add in agar agar.